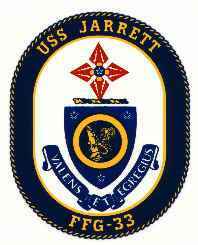 USS JARRETT (FFG-33) is named for the late Vice Admiral Harry B. Jarrett, USN (1898-1974), an outstanding sailor of World War II. He received the Navy Cross for heroism in the Battle of the Coral Sea and served with great valor as a destroyer screen commander for the fast carrier task force operations in the Pacific as well as a bombardment group commander in the Marshall and Marianas campaigns. He was awarded the Legion of Merit for command of his destroyer fire support unit In the Marianas campaign. The Silver Star Medal for gallantry in commanding the destroyer screen for carrier striking the Palaus, the Philippines and the Marianas; and the Bronze Star Medal for heroic actions as Commander Scouting Line for the fast carrier force bound for the raids early in 1945 on Okinawa, Tokyo, and Formosa. Upon the close of World War II, Vice Admiral Jarrett had commanded the light cruiser USS ASTORIA (CL-90); was a member of the staff of the Training Command, U.S. Atlantic Fleet; served as the Plans and Policy Officer (Naval Reserve) under the Chief of Naval Operations; and was Senior Military Attaché, Taiwan, before successive command of Destroyer Flotilla 4 and Cruiser Flotilla4. In February 1953, he became the Deputy Inspector General, Navy Department, serving until his retirement in November 1954. The Shield: The sea-griffin grasping a cannon alludes to Vice Admiral Jarrett as commander of bombardment groups in the Pacific Theater and is placed within a ring symbolizing his command of destroyer screens for fast carrier task forces operating in the Pacific during World War II. The three stars refer to the Admirals rank. The Crest: The cross refers to the Navy Cross the Admiral was awarded for heroism during the Battle of the Coral Sea. 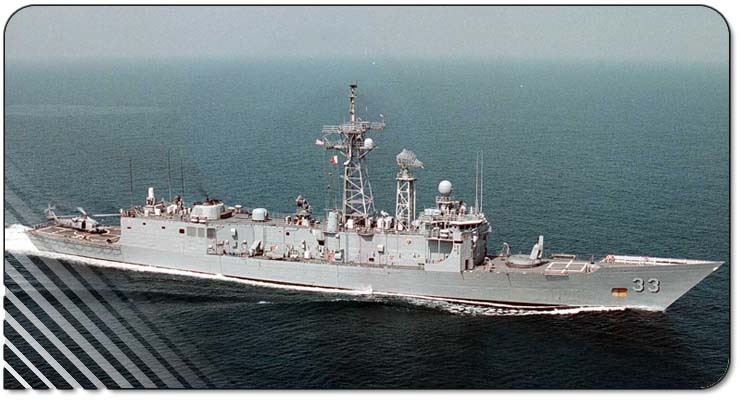 The pheon allude to the multidirectional fire power of the destroyer screen and bombardment group Admiral Jarrett commanded during World War II and reflect the Legion of Merit he was awarded for command of the destroyer support fire during Pacific island campaigns. The two stars on the disc symbolize the Admirals personal heroism for which he was awarded the Silver Star and the Bronze Star. Motto: Valens et egregius which translated from the Latin means "Able and excellent."